WORLD DOWN SYNDROME DAY is March 21… Let’s rock those extra chromosomes! We are dedicated to raising awareness, sharing joy and spreading hope in support of individuals with Down syndrome living in the Grand Strand. We believe that #lifeisbetter with extra chromosomes! Whether your child is a newborn or an adult, we offer various programs to assist your family. Take a look at what we have to offer & feel free to reach out to our coordinators for more information. 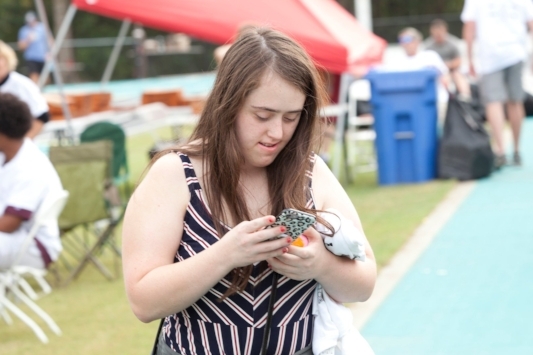 While Grand Strand Down Syndrome Society has a plethora of resources available to you, we have also put together this list of even more places that can assist. Take a look! Did you just find out your new baby has Down Syndrome? "Congratulations!" It's as if you won the lottery. We understand a diagnosis can be tough, but we are here for you! Purchases from our online store will support fundraising efforts of the Grand Strand Down Syndrome Society, which enables us to continually support our members and families. Become a member and receive the complementary benefits or participate in programs and outings all year long. Sign up and be welcomed with open arms. Someone will reply to you soon. Would you like to register an adult/ guardian? Would you like to receive text messages or reminders about upcoming events? Thank you for signing up to become a new member! Our members have the opportunity to participate in our events and programs. Someone will respond to you very soon. Become a member of GSDSS to take advantage of the benefits available to you. Anyone who is interested can join. Together we have the power to create change. Click here to learn how to put your talents toward a great cause. Your generous donation will be used to fund our annual programs for individuals with Down Syndrome. Buddy Walk has ended but you can still show your support GSDSS. The Grand Strand Down Syndrome Society’s 2018 Buddy Walk has come to a close, but you can still be part of the cause to help raise funds for our mission! Whether you have Down syndrome, know someone who does, or just want to show your support, take the first step and donate today. Help us spread the word- all are welcome To Give. stay tuned for 2019 buddy walk info coming soon! SAY HELLO TO OUR 2018 BUDDY WALK SPONSORS!